Sing along with your VeggieTales friends as they belt out 20 tunes from RACK, SHACK & BENNY, DAVE AND THE GIANT PICKLE, VERY SILLY SONGS and more! Includes 'The Dance of the Cucumber', 'I Love My Lips, and 'The Bunny Song', amongst others. 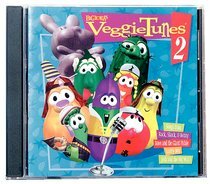 About "Veggie Tunes #02 (Veggie Tales Music Series)"
Customer Reviews For "Veggie Tunes #02 (Veggie Tales Music Series)"
Could it really be true. . . all of Larry's Silly Songs on one CD? SILLY SONGS WITH LARRY contains all of Larry's Silly Songs, featured in THE ULTIMATE SILLY SONG COUNTDOWN! But wait, there's more! You'll also get four bonus songs, including the hilarious "Do the Moo Shoo from THE ULTIMATE SILLY SONG COUNTDOWN video and the never-before-released, fab-u-rageous 'Silly Song Remix Medley.' If you've got a hankering for back-to-back silliness - whether it's in your home, car or boom box - this is the CD for you! Music Manager's Review: This CD is perfect for any fan of the hilarious VeggieTales DVD series - with ALL of Larry's Silly Songs on the one CD. You also get four bonus songs, including the never before released 'Silly Song Remix Medley.' Great fun with great biblical lessons for all ages! The Veggie kids have lost the plot, whining and begging for more toys! It's up to Buzz-Saw Louie, Larry, Bob and Junior to put the meaning back into Christmas before its too late. This DVD includes hours of bonus games and features. 30 minutes. Families will love singing these favourite worship songs - taught and led by Bob and Larry and the VeggieTales crew. The songs were carefully chosen to provide families with a meaningful and memorable way to worship. Features guest artist Matt Redman!